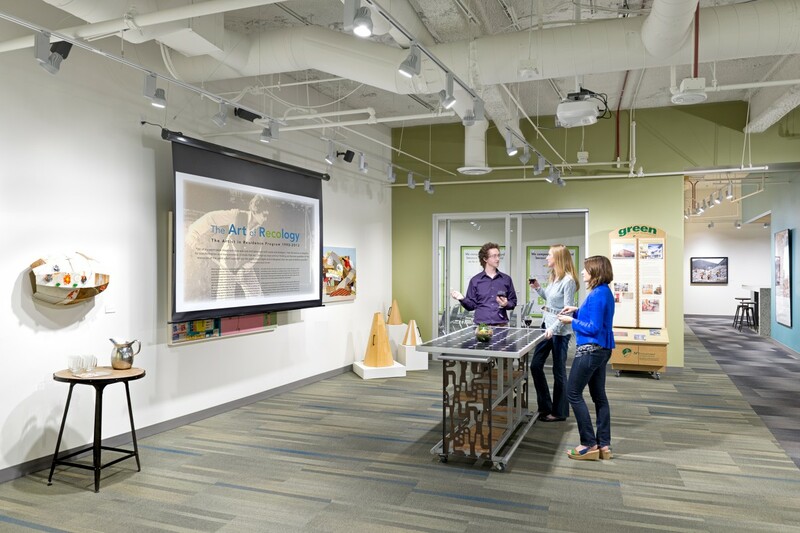 A question we often hear from our clients is, “How can we make our workplace as energy efficient and sustainable as possible?” In part one of this two-part blog, RMW looked at how a large commercial office campus approached this question. 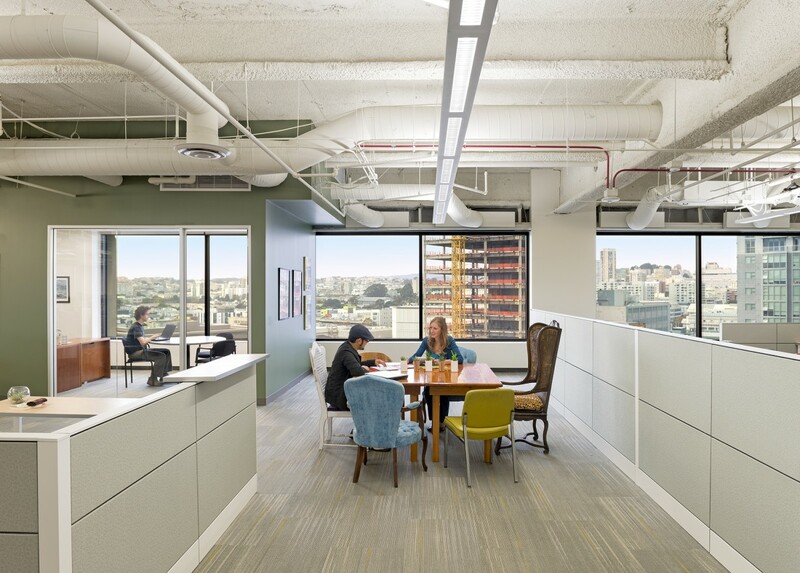 In today’s follow-up, we take a look at a medium-sized office project – a single-floor tenant built-out in downtown San Francisco. This project achieved LEED Platinum certification, and offers many examples of approaches that are scalable to varied workplaces. The San Francisco Department of the Environment (SF Environment) promotes sustainable programs and policies for the City and County of San Francisco. Naturally, when they moved to new offices at 1455 Market Street, they saw it as an opportunity to put their mission into practice. SF Environment envisioned its new space as a demonstration of the sustainable building practices and behaviors it promotes city-wide. The client was highly knowledgeable about and deeply committed to making the project as green as can be from the get-go. 1. Maximize natural light and views. Natural daylight provides full spectrum lighting, which, when filtered for glare, is easier on the eyes because it renders colors more accurately. Studies have shown that workers located near windows or skylights tend to be happier and more productive. Letting more light into indoor spaces also reduces our reliance on electricity. 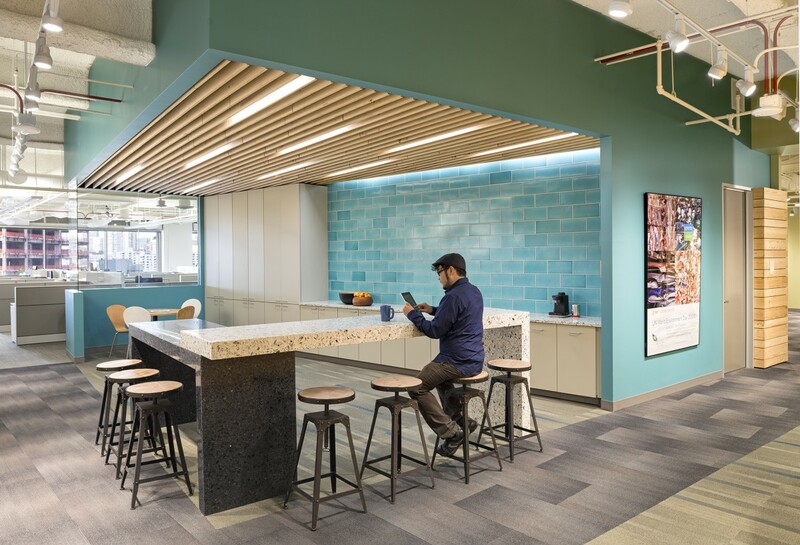 We designed SF Environment’s workspace so that most enclosed rooms are located at the core of the floor plate, with open offices around the perimeter. Work stations installed in the open office space have low walls so as not to block light. This increases the percentage of people who can see a window from their work station. 2. Incorporate LED lighting. When natural daylight isn’t enough, the most efficient option is LEDs (light-emitting diodes). LEDs have a longer lifespan and higher efficiency than most other lighting. Because they’re compact and emit light in a specific direction – unlike traditional incandescent and fluorescent lights, which emit light in all directions – they’re great for spot lighting and in unique architectural design applications. At SF Environment, RMW used LEDs for the track lights in the hallways and gallery/reception area. 3. 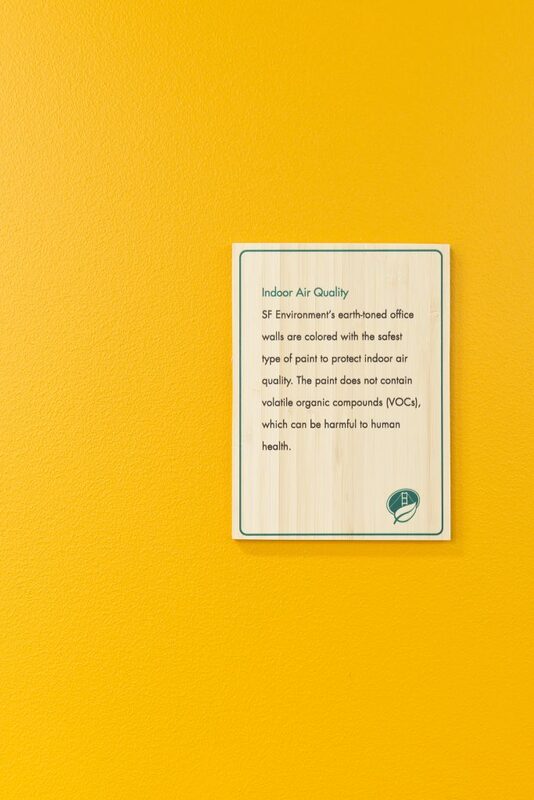 Promote good indoor air quality. Minimize off-gassing by selecting paints and products that contain low Volatile Organic Compounds (VOCs), and install HVAC systems with high-performance filtration devices. Look for Green Seal certified products, which contain low/no VOC and no formaldehyde. If you implement an indoor air quality management plan and select products with low emission levels, your workplace will have significantly reduced indoor air contaminants and you’ll be able to breathe easy. 4. Reduce carbon emissions through alternative transportation. Commuting to and from the workplace is the largest contributor of carbon emissions. Provide bicycle parking and lockers/showers, and – if possible – choose to lease near major public transportation hubs. In March 2012, San Francisco passed the Tenant Bicycle Parking in Existing Commercial Building Ordinance, which requires commercial property owners to allow tenants to bring their bicycles to their leased space, or to provide secure on-site or off-site bicycle parking. SF Environment was able trade some of their lease-allocated parking spaces to create a bicycle cage in the garage, and teamed up with another tenant (San Francisco County Transportation Authority [CTA]) to allow for a larger shared space, including a bike repair station, shared bikes for employee use, and access to the other tenant’s shower rooms. 5. Clean green. SF Environment has created a list of green products and services that have been determined to have low environmental impact. Products receive scores based on their effect on human health, waste creation, and method of manufacturing. By using products on the SF Environment’s Cleaners and Cleaning Supplies list, you can be sure you’re not introducing toxic chemicals into your workplace. 6. Get natural. Studies have shown that we react to a natural environment by becoming less anxious, breathing more deeply, and increasing our ability to concentrate. 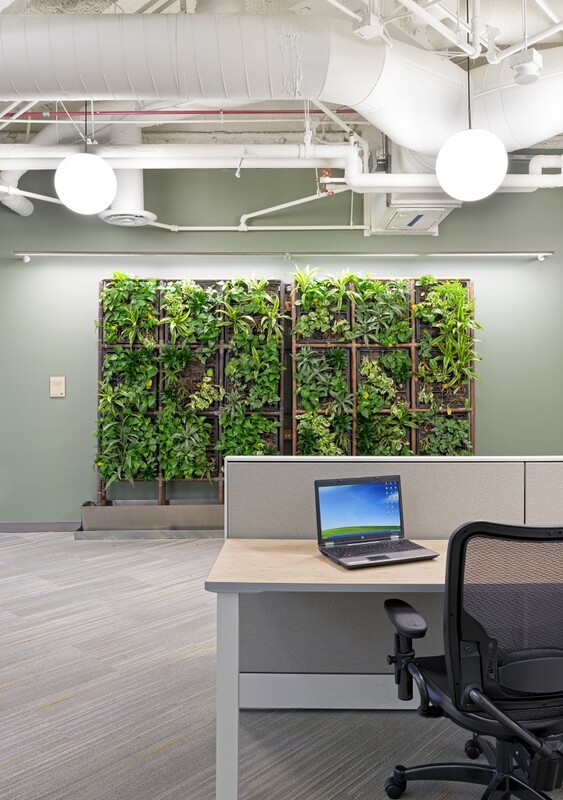 SF Environment’s living wall, designed by Rana Creek landscape architects, adds beauty to the office while producing oxygen and absorbing carbon dioxide. Simply by incorporating plants or a green wall into your space you make it a place people want to be.